They decided that Loki needed his own movie, where he popped up at key moments in history, being his chaotic self. Hardwick suggests that he should be The Doctor's companion, and with the TARDIS they can do just that. Because surely, these characters of Norse legend have a valid place in the world of Doctor Who. And the Rainbow Bridge is more sciencey anyway. 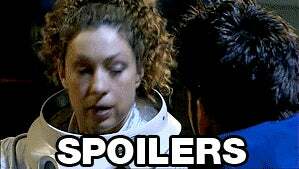 I just watched Silence in the Library, where The Doctor meets River Song for the first time. When flipping through her notebook, to see where they are on the timeline, she asks him if they've been to Asgard yet. Sidenote: why is there no gif yet of Martin Starr from the Geography of Global Conflict episode of Community, saying "the math checks out" or whatever?! This is the perfect opportunity to use it!!! Anyhow, I've decided I need to step away from it for a brief interlude. That is surely the first sign of an overdose.